The revision of the World Health Organization’s ICD-10 and development of ICD-11 was launched in 2007. After several extensions to the timeline, WHO plans to present a version of ICD-11 at the World Health Assembly, in May 2018, with the intention of releasing the new edition at some point later that year. Endorsement will be sought later. In order to be ready to present in May 2018, the final round of editing will need to have been completed by the end of 2017. This November 2016 presentation by WHO’s Dr Robert Jakob sets out the targets and timelines, as they had stood last year. There was a March 30 deadline for submission of proposals for consideration for inclusion in the 2018 version. Proposals received after that date are expected to be rolled forward for consideration for inclusion in the first annual maintenance and update revision of the new edition, in 2019. 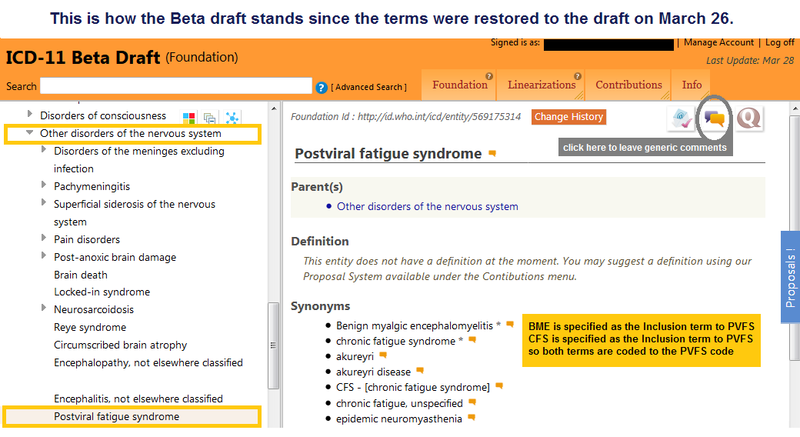 On March 27, UK and US advocates, Suzy Chapman and Mary Dimmock, submitted a formal proposal via the ICD-11 Beta draft Proposal Mechanism for the restructure of the ICD-10 G93.3 legacy categories: Postviral fatigue syndrome; Benign myalgic encephalomyelitis; and Chronic fatigue syndrome. There has been considerable support for the proposal, with over 540 “Agrees.” International patient, advocacy and research organizations and individual stakeholders have submitted more than 370 comments. We are inviting international patient and advocacy organizations and other stakeholders to review and comment on the proposal. In order to view the proposal in the Proposal Mechanism you will first need to register with the Beta platform (you can register, if you wish, using an existing social media, Yahoo, Google or MS account). 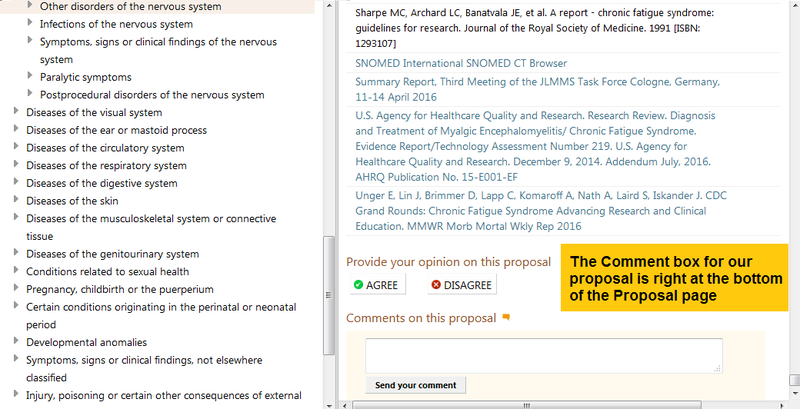 If you would like to leave a comment on our proposal, the “add new comment” box is located right at the bottom of the web page, under the most recent comments.